To help Lawn Care Operators (LCOs) better manage key weeds and diseases in their area, Syngenta offers free resources with timely alerts and notifications available from GreenCast® Online. Soil temperature is a key indicator of conditions favorable for the development of certain pests. Syngenta recently introduced Soil Temperature Alerts, a free tool that allows subscribers to track soil temperatures anywhere in the U.S., receive personalized alerts on potential pest activity and access 10 years of soil temperature archives. To build these alerts, Syngenta identified key diseases and weeds and the temperatures at which they emerge. This information can help LCOs ensure timelier, more effective treatments when conditions are favorable for these pests. An example of the weeds LCOs can sign up to receive soil temperature alerts about. In addition to the pre-determined pests, subscribers can customize their own soil temperature alerts. Users can sign up to receive email or text alerts when target soil temperatures reach the pre-determined thresholds in your area for eight different spring or fall pests. Knowing the soil moisture in your area can help improve water conservation and provide better turf conditions. Free soil moisture maps available on GreenCast can provide daily, five-year and ten-year soil moisture averages for any location across the country, which can assist in making strategic decisions that affect turf growth and maintenance. Growing degree day (GDD) accumulation is commonly used in row crop agriculture to predict important events in plant development, such as crop maturity. 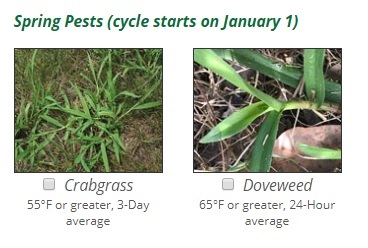 In turfgrass management, GDDs are utilized to predict weed seed germination, seedhead emergence and insect pest activity. Since weather patterns can vary from one geographic area to the next and from year to year, GDDs allow LCOs to monitor heat accumulation in their area, which translates to the development of plants and insects. It also allows LCOs to refine product application timing based on actual weather patterns in their area, rather than a predetermined calendar-based schedule. Sign-up for GDD email alerts that are specifically targeted for your area. For more information about these and other free resources available from Syngenta, visit GreenCastOnline.com. ©2019 Syngenta. GreenCast® and the Syngenta logo are trademarks of a Syngenta Group Company.